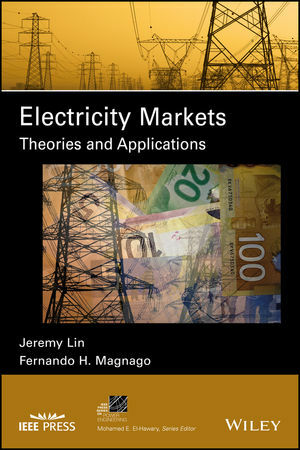 Electricity Markets: Theories and Applications offers students and practitioners a clear understanding of the fundamental concepts of the economic theories, particularly microeconomic theories, as well as information on some advanced optimization methods of electricity markets. The authors—noted experts in the field—cover the basic drivers for the transformation of the electricity industry in both the United States and around the world and discuss the fundamentals of power system operation, electricity market design and structures, and electricity market operations. JEREMY LIN, PhD, is a Senior Engineer at PJM Interconnection. Dr. Lin also consults with a number of electric utilities and electricity market operators around the world on emerging issues, particularly on electricity markets. FERNANDO H. MAGNAGO is a Professor at the National University of Rio Cuarto, Argentina, and Application Manager for Nexant Inc., USA. He is also a Senior Member of the IEEE. Dr. Magnago has contributed to over fifty journal papers on the topic of power systems.